With a sprinkle of fairy dust, create your own magical Lego® world, and get lost building a land full of mermaids, fairies and pirates! 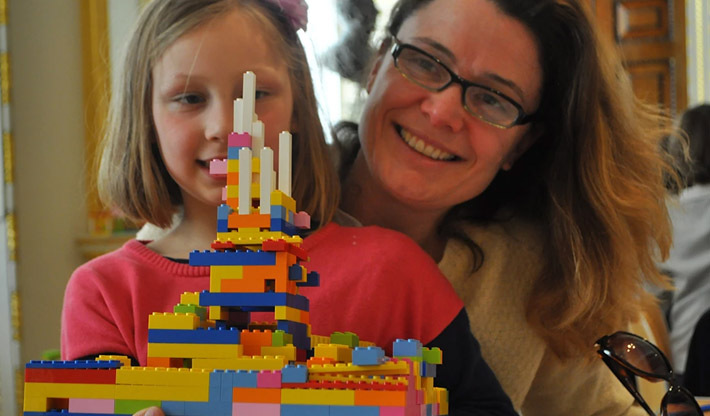 For children (and adults) who don’t want to grow up the Royal Academy of Arts Never Never LEGO Land is a must. . Family trails are available too and Anselm Kiefer exhibition runs until 14th December. Pop along to Regent’s Street and head to Hamley’s – great window displays, snow at 5pm everyday and a certain bear is there available for photos – yes, it’s the “The Bearer of Gifts” Paddington Bear! If you’ve already started the Christmas shopping, a free personalized skin is the perfect Christmas stocking filler. Or you can always jazz up your own phone or iPod for the festive season! Cost: Free – drop in. Exhibitions require tickets, under 16s are free. 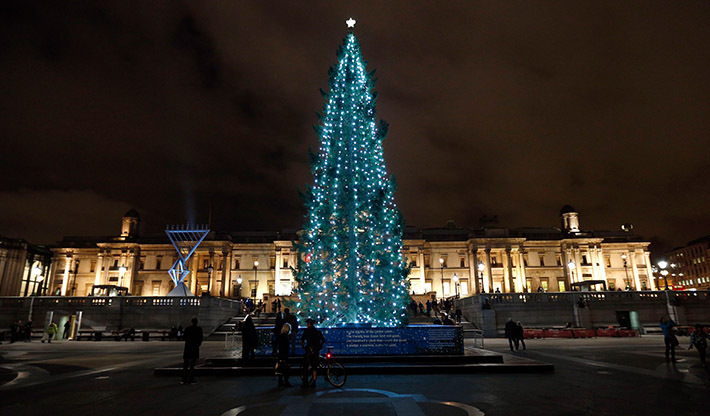 The countdown to Christmas starts with the lighting of the world’s most famous Christmas tree this Thursday 4th December from 6pm. The Norwegian Spruce is a gift from the people of Norway to London to say thank you for Britain’s support during World War II. This historic tradition has happened every year since 1947. The tree will be lit by the Mayor of Westminster, Norwegian Ambassador and governing Mayor of Oslo. On Sunday 7th December at 5.30pm you can take part in the Blessing of the Crib and join a torch-lit procession on the steps of St Martin-in-the-Fields. 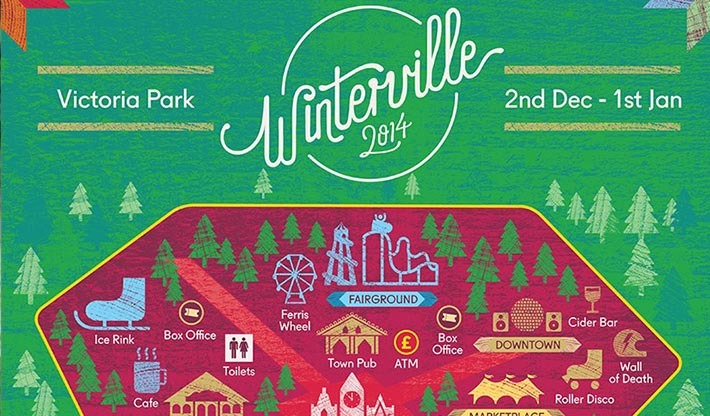 Plus enjoy festive carols beneath the Christmas tree in Trafalgar Square from 8th to 23rd December. Performances take place from 4-8pm weekdays, and 2-6pm weekends. Head to the West Piazza in the morning of Saturday 6th December for the 34th Great Christmas Pudding Race in aid of Cancer Research UK. 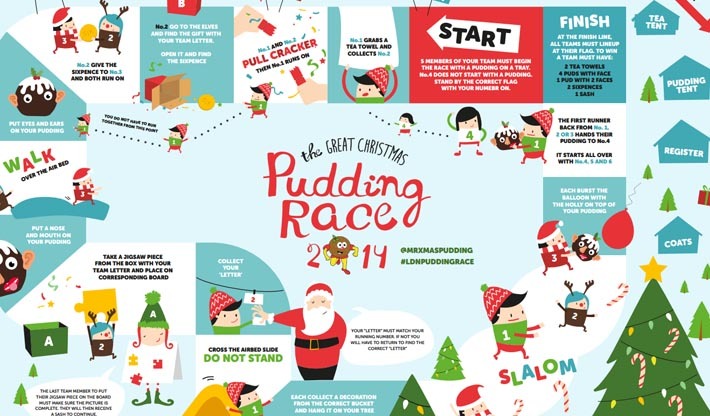 The Great Christmas Pudding Race is an old tradition in Covent Garden which features a huge obstacle course, a giant inflatable slide and some fantastic fancy dress outfits. Entertainment starts at 11.15 and the first race kicks off at 12.10pm. While you’re there, don’t miss the LEGO Snow Globe Featuring 120,000 bricks, it took Duncan Titmarsh, the UK’s only Certified LEGO Professional, 75 days to build. London themed, it features some of London’s most iconic building including The Shard, Big Ben, Nelson’s Column and The London Eye. Above the London skyline is the man of the moment – Santa! Create your own ‘pop up’ Christmas cards using a range of festive materials and archive photographs from past Christmas celebrations at the Foundling Hospital. With plenty family friendly trails to enjoy including the Hetty Feather Trail, there is also the dressing up corner where you and kids can dress up as a character inspired by the Foundling Hospital, such King George, a Foundling pupil, a Victorian servant or soldier or you can curl up in the family book corner and read about the Foundling Hospitals history. 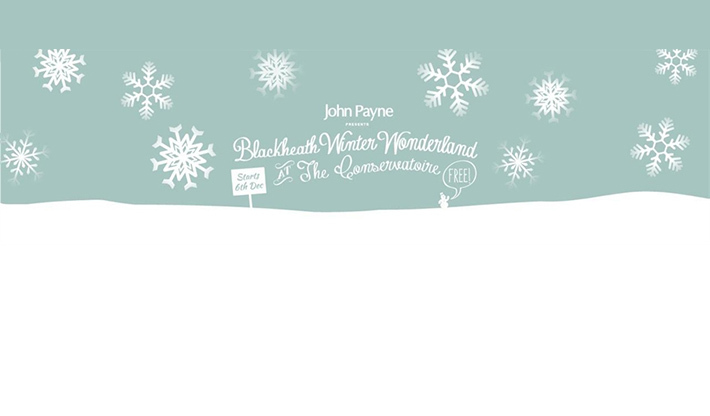 Bringing the snow and excitement of the Arctic along with the magic of Christmas, Blackheath Winter Wonderland offers a festive family treat for all! Children’s activities including a mini Arctic sensory play area, storytelling sessions with none other than Mrs Claus, creative workshops There’s a mini Christmas market offering local craft stalls, the sound of carols, as well as mulled wine and yummy treats. Plus most importantly, there is the promise of snow, on the hour every hour through until Christmas! A take stroll through the village and enjoy a treat at Black Vanilla, festive flavours include Chocolate, Clementine and Cranberry gelato and Mulled Wine Sorbetto – they do great coffee too. Walk over the heath, there’s a great path for scooting kids, and you’ll find yourself in Greenwich Park;home to the Royal Observatory. Cost: £20 per child for a workshop only ticket, £1 per adult for a workshop only ticket. 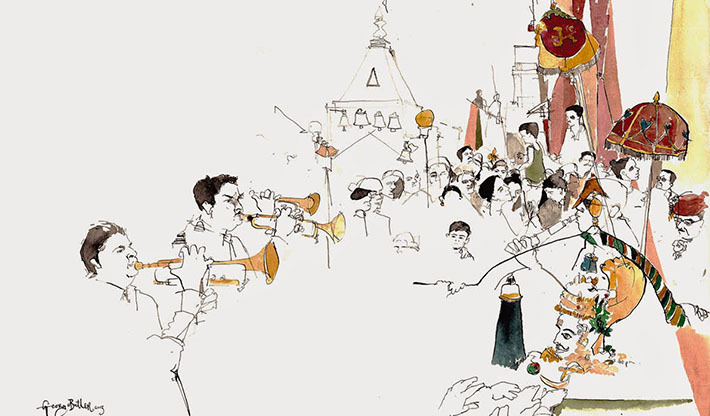 The 19th Annual Winter Exhibition at the Illustration Cupboard embraces everything exciting and innovative about illustration art. As part of the exhibition, Winter Festival Days invite critically acclaimed children’s authors to sign their latest books – a great and unique Christmas present idea. Visiting authors on Saturday 6th December include Lauren Child, who will be there at 1pm to sign The New Small Person and Shirley Hughes with Clara Vulliamy, signing Dixie O’Day from 3pm. With Fortnum and Mason’s a five minute walk away, pop along and see their magical window displays and if the crowds aren’t too much, enter the aladdin’s cave of all things Christmassy. Going to see The Nutcracker and The Mouse King at the Unicorn this Saturday? Arrive early and let the kids enjoy the Unicorn UP Club. The first and only rule of UP Club is to have fun. Kids get to make, create & play things. Most Saturday’s it’s free but this Saturday the kids get to create their own snow shaker globe full of magic! It’s £6 each and includes an ice cream at the interval. The Unicorn Theatre is in a great location with the immediate area to be enjoyed pre or post show. A two minute walk from the River Thames, there are the fountains (maybe go here after the show – no one wants to watch a show in wet clothes!) by The Scoop at More London (1,000 person sunken amphitheatre) and great views across the Thames of the Tower of London. Tower Bridge is on your right – with it’s new glass walkway feature and there is a great green space for kids to explore. There will be festive fun in Riverside Hall and the Design Museum Shop this Saturday – a great place to find a brilliant selection of the most fun, beautiful and useful gift ideas for Christmas. There’s a Christmas craft make and create drop in workshop between 2pm and 4pm where kids can make some stylish Christmas decorations. Let the kids use their design skills to cut and fold paper to create glamorous decorations for Christmas trees or mantelpieces; lots of sparkle and colour will be on hand! 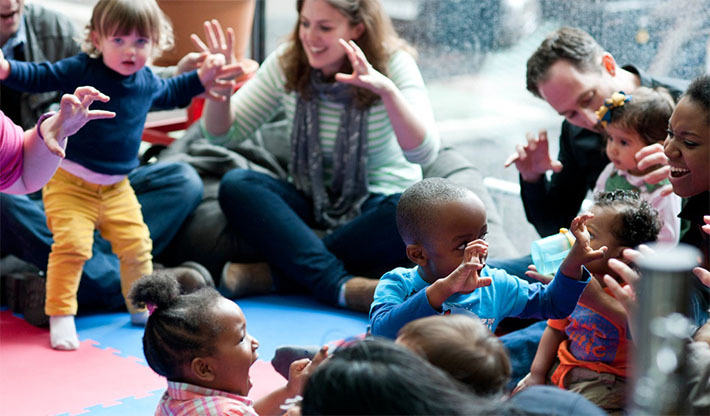 Plus All Voices, the Hackney and Islington Community Choir, are singing at 3pm. Throughout the event there is chocolate and biscuit tasting in the shop – yum. Don’t forget the Christmas shopping opportunity too! 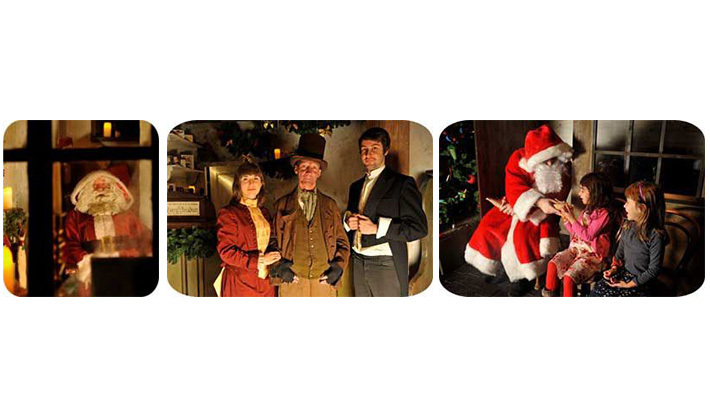 Meet Santa in his secret grotto in the Museum of London Docklands festive 19th century Victorian Walk. Make sure the children are ready to tell him their Christmas wishes – if they’ve been good, they’ll receive a special gift too. As you’re in the Docklands, why not walk over the bridge and enjoy watching the skaters at Canary Wharf’s Ice Rink, there’s a Christmas Market too – particularly magical as the sun goes down the Christmas illuminations get swtiched on.